There is a relaxing air about Évian-les-Bains, an elegant spa town in eastern France, as it gazes out over Lake Geneva (or Lake Leman) towards Lausanne in Switzerland. Everyone knows the name of Évian, thanks to the bottled waters sold all over the world, and the town which gives the water its name is more than worth a visit. The wide, clean streets sweep into the town, giving a feeling of light and space enhanced by the sparkling waters of the lake. The architecture of the town is elegant without being too sophisticated, creating a relaxing ambience. Here you will want to treat yourself to a spa treatment, take the waters, chill out, kick back… there can be few places better to allow yourself to escape the pressures of modern life. If you are feeling energised by your spa treatments and feel a little shopping spree may be on the cards, then prepare yourself for a thoroughly enjoyable experience. Évian-les-Bains has numerous fascinating shops, some of which are so hidden from view that even when you think you have seen them all, you will stumble across a new one. There are many excellent restaurants in Évian, but choose one on the lakeside for a truly atmospheric dining experience. Fresh fish is the order of the day, and, sitting here, sipping your chilled wine on a balmy summer evening and watching the lights dancing on the water, you could actually believe that this is paradise! Évian-les-Bains is a perfect playground for both summer and winter, as there are numerous sporting opportunities here whatever the season. In the summer you can find golf, mini golf, water sports, tennis and many more sports on offer, while in winter you are close to the snow resort of Thonon-les-Bains where you can ski and snowboard. If you prefer to continue the relaxing theme when getting out and about you might enjoy a boat trip across the lake to Switzerland. Finally, on a more mundane but equally enjoyable note, there is a great Farmer's market in the town every Friday… don't miss it! You can find direct flights to Lyon with Air France, British Airways, bmibaby, easyJet and bmi, or to Chambery with flybe and Jet2, or to Geneva with British Airways, easyJet, flybe, Jet2 and Aer Lingus. If letting the train take the strain is your idea of relaxing travel, you can take the Eurostar to Paris, followed by the TGV fast train service to Lyon or Grenoble. 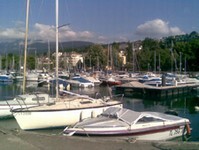 In general, property prices in and around Évian-les-Bains are high. The area is highly sought after, and property buyers know that there is a strong rental market here which allows them to offset a high purchase price against a useful income. Property types vary, with both old townhouses and modern apartments on offer. Do you know Évian-les-Bains better than we do? Do you have photos of Évian-les-Bains? Évian-les-Bains is found in the north of the Haute-Savoie department in eastern France, which borders Switzerland. The town lies on the shores of Lake Geneva. Access: By air: Fly to Geneva, Lyon or Chambery. By rail: You can get to Paris by Eurostar, then change to a super fast TGV to travel to Lyon or Grenoble. Economy: Chiefly, the economy is based on spa tourism and bottled water. Also, manufacture of precision instruments. Interesting fact: The first water was bottled here in the early eighteenth century!